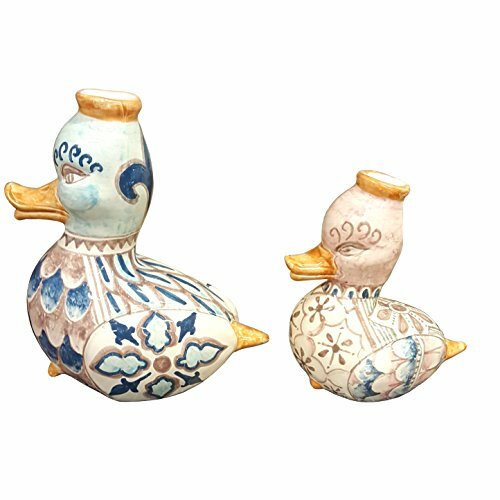 Ceramic set 2 Candlestick Holders, or you can use for Vase Flowers or Ornaments Duck ,Decorations : Geometric . Net weight Kg.1,300, Dimensions: Big 7.48 H inch x 6.69 inch Small 5.51 h inch x 5.12 inch --All our products are lead-free and can be used for foods, can go in the dishwasher and in the microwave-You can ask any other customization, buy directly from the manufacturer of Tuscan craft. Hand painted by "Ceramiche d'arte Parrini" , since 1979. The item (with certificate of authenticity )may vary slightly from the photos, each object is considered unique . If you have any questions about this product by CERAMICHE D'ARTE PARRINI since 1979, contact us by completing and submitting the form below. If you are looking for a specif part number, please include it with your message.